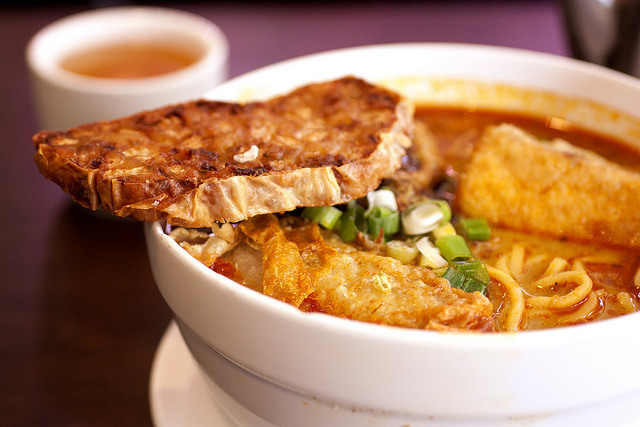 There’s no meat in the Curry Mee with Young Tau Foo ($7.25) from Gold River Malaysian, but there’s no lack of flavor. Egg noodles swimming in a creamy lemongrass coconut curry soup with vegetable and fishcake stuffed tofu would be enough, but it’s also topped with a vegetable fishcake slice fried to golden, crunchy perfection. Much appreciated is the fact the slice comes balanced on the edge of the bowl so no sogginess ensues in the travel time from kitchen to table. It’s the little things that make for great happiness.